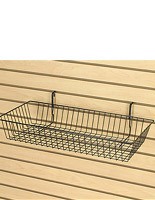 Display baskets for slatwall use are in stock today at StoreFixture.com! We stock 100s of other slatwall baskets & accessories as well! 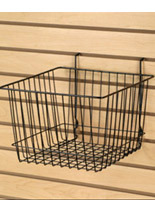 Slatwall accessories like these display baskets are perfect for holding small, bulky or loose merchandise. 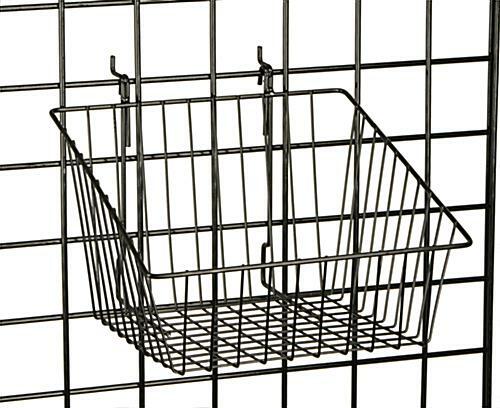 With its angled front, this wire basket allows your customers to easily view and browse your products. Made of quality black wire, these display baskets are durable yet economical products. 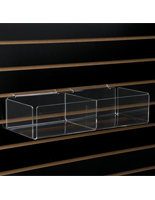 The displays baskets fit on all of our slatwall panels and attach without the use of any tools or adhesives. Just hook the baskets into your slatwall panels and fill with products. It's as easy as that! Because they are so easy to use, you can add, removed or change your display fixtures whenever you'd like! These wire baskets measure 12" long x 12" wide, and have sides that are 4" high in the front and 8" high in the back. Since they are made out of high quality welded wire, these display baskets can hold light to medium weight products without bending forward. With a sloped front, your customers will be able to see and access your contents easier than with other baskets. Slatwall accessories like these angled display baskets are ideal for holding travel products, cosmetics, candy and samples.